Kettering Town switch their attention to the Buildbase FA Trophy this weekend. The Poppies take on Evo-Stik Northern Premier League Division One South side Market Drayton Town in the first qualifying round at Latimer Park tomorrow (Saturday) afternoon. And, despite their inconsistency in the league, first-team coach Steve Kinniburgh insists the Poppies will be looking to go “as far as possible” in the competition, having enjoyed a good run in the Emirates FA Cup, which was ended at the hands of Vanarama National League side Solihull Moors earlier this month. “We had a good run in the FA Cup and I was disappointed with how it ended,” Kinniburgh said. “I know we were playing against a National League side. “But I felt we had a chance to do something in that game but unfortunately it didn’t work out for us. “We have to have the same ambitions for the FA Trophy, we want to go as far as possible. “We are playing a team from the level below but it means little in knockout football. The Poppies made another addition to their squad ahead of Tuesday’s 1-0 defeat at Chesham United in the Evo-Stik Southern League Premier Division. 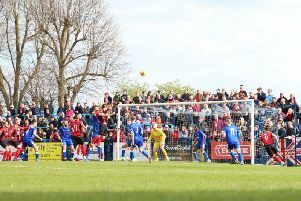 Former Luton Town and Kidderminster Harriers striker Matthew Barnes-Homer was named among the substitutes and made his debut in the second half. And Kinniburgh believes Barnes-Homer’s arrival adds welcome competition for places. “Matthew is another striker into the mix,” he added. “Him coming here gives us fantastic options with the likes of Spencer [Weir-Daley], Aaron [O’Connor] and Rene [Howe]. It’s not a bad firing line we have got. “It’s always important to make sure players don’t get too comfortable, you don’t want anyone always expecting to play.